Padmasambhava Buddhist Vihara or Golden Temple is built in typical Tibetan style. Padmasambhava Buddhist Vihara is located 70 km away from Mysore and 220 km from Bangalore. The Tibetan Golden Temple is located half way to Madikeri at Koppa. The Dalai Lama inaugurated the Buddhist Vihara in September 1999. Shantop-clad Buddhist monks and nuns gather at this place of worship. The altar is highly ornate with spiral columns separating the 3 idols and peopled by dragons and divine figures. 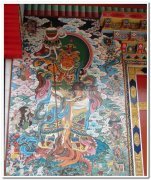 The temple was constructed according to the Tibetan tradition with exquisite paintings and sculptures.